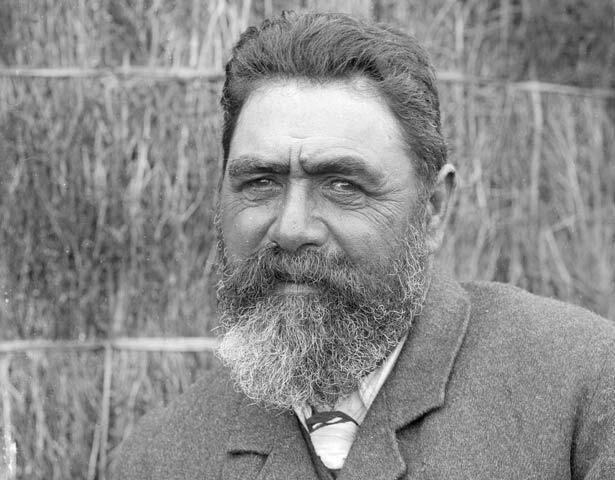 Wiremu Te Kākākura Parata, of Ngāti Toa and Te Āti Awa, was born on Kapiti Island in the 1830s. He grew up in a time of great social and political change. During the 1860s he became involved in politics, and was elected to Parliament as the member for Western Māori in 1871. He was an astute politician and a skilled orator and debater. He often urged the assembly, dominated by European settlers, to pass laws that took account of Māori needs and aspirations. But many Māori were highly critical when, after being promoted to the Executive Council in 1872, he stopped speaking out for them. After leaving Parliament Parata took part in court claims over Māori land. His most notable case, in 1877, was Wi Parata v the Bishop of Wellington. This concerned the gift of Ngāti Toa land to the Anglican Bishop for a Māori school at Porirua. The Church had received a Crown grant of land in 1850, but no school was built. Parata sought a return of the land. In his judgment Chief Justice Prendergast famously declared that Māori were a primitive tribal society possessing no laws capable of recognition or protection by the Courts. The Treaty of Waitangi, moreover, could not call into being a native title that did not exist. As such he held that the Treaty, in a legal sense, was no more than a 'simple nullity'. Parata died in 1906. Nō ngā iwi o Ngāti Toa, o Te Āti Awa a Wiremu Te Kākākura Parata. I whānau mai ia ki Kapiti i te tekau tau atu i 1830. I tana taiohinga haruru ana te whenua i ngā panonitanga nui ka pā mai ki te noho me te ora o te tangata. I te tekau tau atu i 1860 ka kuhu ia ki ngā kaupapa tōrangapū o te wā, ā, i te tau 1871 ka pōtitia ia hei Mema Pāremata Māori mō Te Tai Hau-ā-uru. He māia a Parata ki ngā mahi tōrangapū; he reo tatakī, he tohunga ki te whiriwhiri kōrero. Ka rite ngā wā ka whakahau ia i te whare kikī ana i te Pākehā kia whakamana i ngā ture ka aro ki ngā hiahia me ngā tūmanako o te Māori. Hāunga tērā, kei reira anō ngā whakapae a ngā Māori e mea ana i tōna kakenga ki te Kaunihera Whāiti i te tau 1872, ka mutu tana hāpai i ngā take Māori. I te wehenga o Parata i te Pāremata, ka whai wāhi ia ki ētahi kerēme whenua Māori i ngā kōti. Ka tū te kerēme nui i te tau 1877, ko Wi Parata v Bishop of Wellington, mō ētahi whenua nā Ngāti Toa i tuku ki te Pīhopa Mihinare hei whakatū kura Māori. Ka whiwhi te Hāhi i tētahi pito whenua mai i te Karauna i te tau 1850, heoi, kāore i whakatūria he kura. Ka tono a Parata kia whakahokia ngā whenua o Ngāti Toa. Ka puta te whakatau rongonui a te Kaiwhakawā Matua a James Prendergast e mea ana he iwi mohoao te iwi Māori, kāore ōna ture hei aronga mā tētahi Kōti. I tua atu, ka kī ia, kāore he mana ā-ture o te Tiriti. Ka mate a Parata i te tau 1906. We have 1 event in history, 40 biographies, 7 articles, related to Wiremu Parata.